Gross Area: 127,000 sq. ft.
Area Per Student: 158.75 sq. ft.
Mountview Middle School was designed to advance the district’s ability to deliver a progressive, 21st Century curriculum and provide welcoming and versatile community-use space. Mountview Middle School serves sixth, seventh, and eighth grade students from the Town of Holden, one of the five Central Massachusetts towns that comprise the Wachusett Regional School District. Designed to replace an overcrowded, outdated, inefficient, and inaccessible building dating back to 1967, the new three-story, 127,000 square-foot school was built for a population of 800 students. Two wings of the building are connected by a central lobby and entrance. One wing houses shared spaces like the cafeteria and gymnasium, with the other wing dedicated to academics. The academic section of the building has three floors, one for each grade, each with 12 classrooms divided into two pods, one gold and one blue, for the school colors. The educational program is a team-based curriculum with classrooms clustered around common meeting areas. 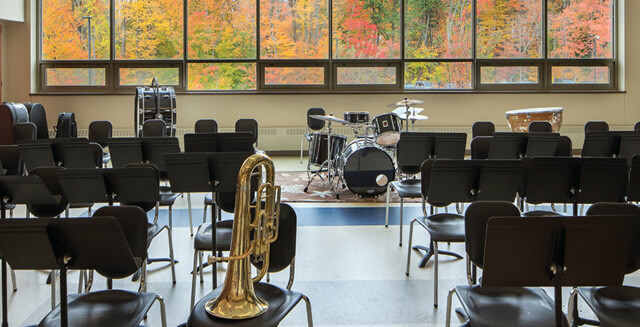 Mountview’s “school within a school” approach provides an approachable scale for young learners while also providing the core advantages of a large facility. To bring forth the most salient program issues, we held meetings with the superintendent, principal, faculty and staff, paying attention to the way both the curriculum and other services were delivered, exploring future as well as current needs. 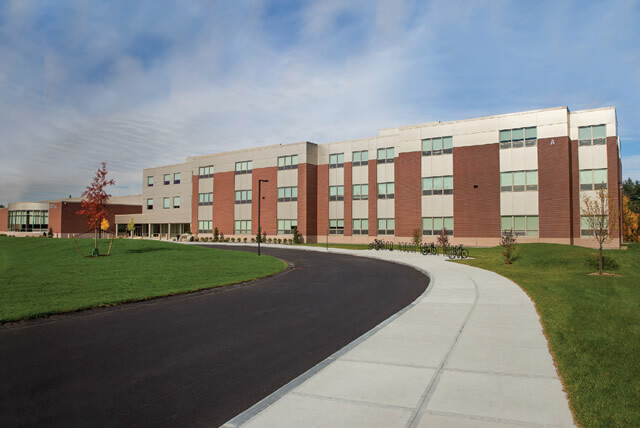 A progressive educational vision is one of the hallmarks of Wachusett School District and the goals that flowed from this vision were the driving force behind the architectural design of the new school. Important program features included: common room development, easily reconfigured partitions to accommodate future needs, welcoming community use spaces, and significant teacher planning and meeting rooms. 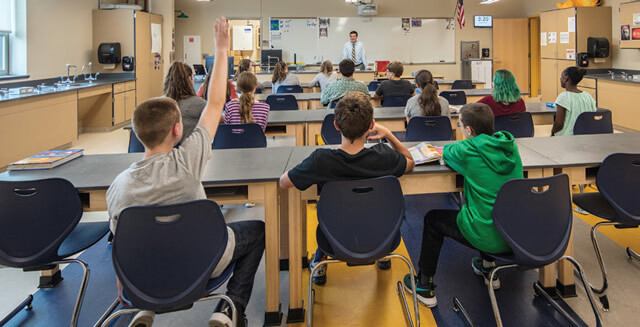 The School district sought an energy efficient design to both maximize the quality of the learning environment and minimize operating expenses. The team considered a number of sustainable design options, carefully weighing benefit versus costs and potential return on their investment. A photovoltaic array is projected to provide 50 percent of the power for the facility—reducing operating costs as well as reliance on distant energy sources. Additional sustainable design features include: durable low-maintenance flooring, strategies to reduce water use, advanced low-emitting materials, improved indoor air quality through advanced heating and ventilation systems, and daylighting in classrooms. 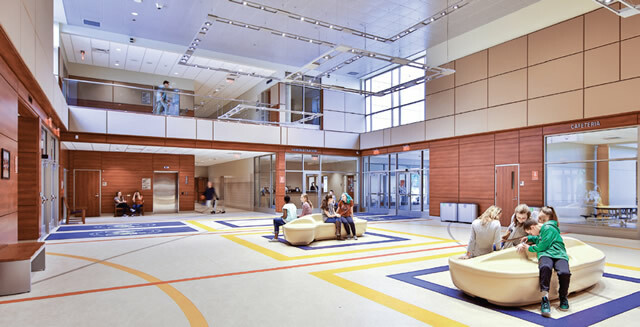 The school has been verified by the Massachusetts Collaborative for High Performance Schools in recognition of the advanced sustainable design features. Safety and security were carefully considered for the Mountview project. The main administration suite is positioned in a control point to view the parking area, main entry, lobby, and corridor access. Once classes begin, the main vestibule is locked, forcing all visitors to enter through the main office before gaining access to the school facilities. Sophisticated access control and surveillance systems are incorporated into the school for further administrative control. The new building sits directly behind the original Mountview building, which was demolished and converted to parking spaces and playing fields. Sitework included tennis and basketball courts; Babe Ruth baseball, softball, track and soccer fields. Additionally, the safer site circulation separates bus and parent traffic patterns. Integrating extensive use of technology was a priority for the district. Advanced technology systems were specified capable of supporting one Chromebook per student and interactive white boards are in every classroom and common area. Because every student has a laptop, the administration opted to take a unique approach to the design of the media center/library facilities. The common areas throughout the school are equipped as “internet cafés” with movable carts of books. With these more dispersed facilities, the size of the central media center could be reduced. The media center is roughly the size of two classrooms to hold the book collection, meaning that in the future the space could be repurposed as classrooms, if needed. Each grade has its own art classrooms, science classrooms with laboratory facilities, as well as special education facilities including spaces to support inclusion as well as collaborative programs lending an opportunity to support diversity and encouragement to all to succeed. The wing of the school with shared and community-use space includes the cafeteria and kitchen, gymnasium, band, choral and orchestra rooms, and a drama space with a stage. 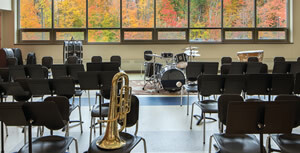 Separate spaces for music instruction have been a welcome change from the previous building which had academic classrooms adjacent to the (sometimes loud) music rooms. Beautiful grounds and views. Nice use of floor graphics to create more interesting, active spaces. 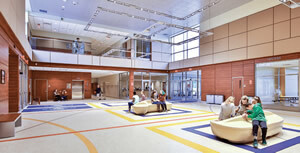 Advanced sustainable design features warranted Collaborative for High Performance Schools (CHPS) recognition.